The Skoog 2.0 Tactile Musical Interface is advertised as a, “tactile musical instrument” that, when paired with a compatible iOS device, can be used to produce music by pressing on one of five colour-coded buttons. It has been promoted as an accessibility device, serving individuals with both physical and cognitive disabilities, with the intent of removing barriers from musical participation and creation that may be present with more traditional instruments. Currently, three apps have been released on Apple’s app store specifically for use with the device: Skoog, Skoog Skratch, and Skoog Access. 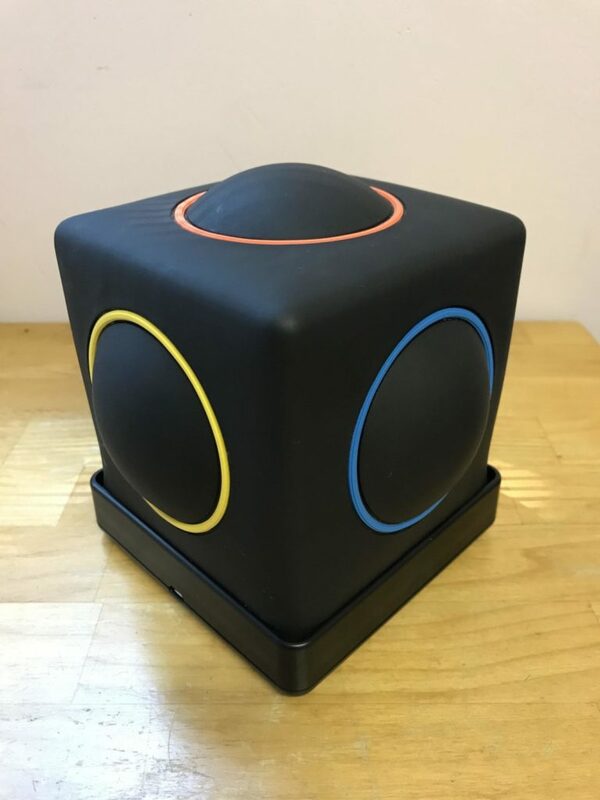 The Skoog is also able to connect with current Apple programs such as Swift Playgrounds, GarageBand, and iTunes to provided extended features. It is Bluetooth-enabled, wireless, and advertises a rechargeable battery that supports ten hours of continuous use with a three hour charge cycle. Once set-up, can be used immediately to produce music alone, play along with iTunes library, or follow colour-coded songbook of familiar songs included within Skoog app. 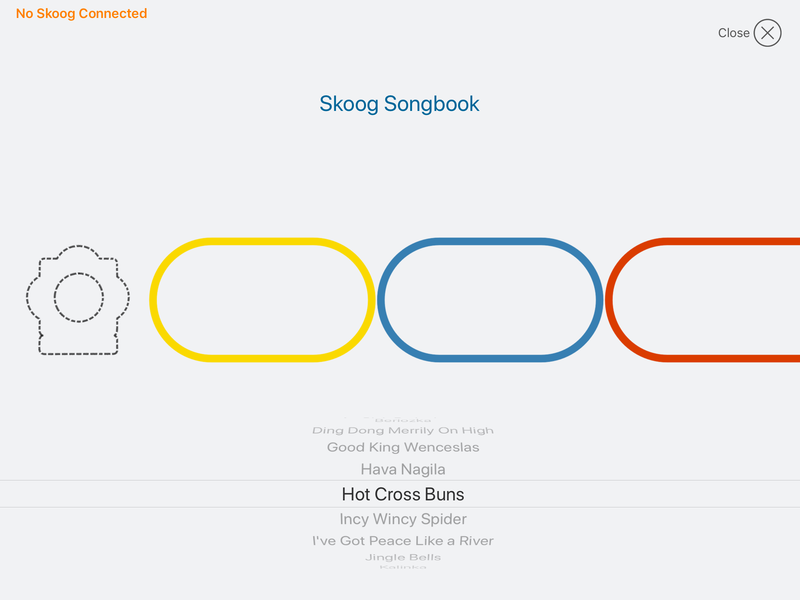 As a purely recreational music device, Skoog does provide an interactive, accessible experience that is unique from traditional musical expression. It is visually engaging for users and has an immediate cause-effect feedback that reinforces learning and continued interaction. There are a variety of settings available for personalization and sound modification, and these are relatively easy to access and adjust. Use of music modes and features has been well-planned to be adaptable to a wide variety of musical genres and activities, but there is discontinuity between the intended user demographic and practical applications for use. For example, interactive activities with iPad apps, such as the songbook feature, require dual referencing and spatial problem solving. Users must look at the iPad for instruction on what button comes next, retain this information while they shift their eye gaze to the Skoog and locate the correct button colour (which may require rotating the cube and changing visual perspective), pressing the selected button, and then returning their gaze to the iPad to find the next note. It is not possible to adjust the setting to create an errorless experience or prevent stimming behaviour on a single note. It is easy for users to produce sound with the Skoog, though this does not automatically equate to producing music. The apps currently available need continued development before being fully functional for use. Though it is possible to personalize features to adapt to each individual user, there are significant limitations for use which need to be considered, particularly for complex diagnoses, which decrease accessibility. Until further software developments are made, the Skoog should not be considered as an accessible communication device. Both the Skoog device and accompanying apps show considerable thought has been made as to how to create an accessible, engaging experience for those with cognitive and physical disabilities, and the potential is apparent for future use; however, the current version falls short of expectations when trialed under realistic conditions.